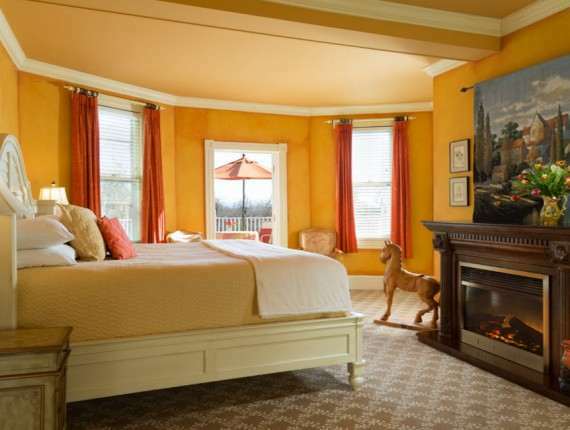 Indulge your senses at our luxury Shenandoah Valley bed and breakfast in heart of Virginia wine country. Our guest rooms or suites are tastefully and individually decorated with European and Victorian antiques, some with fireplaces, all with private bath and fabulous views. “A breakfast of one’s dreams”- Washington Post. Villa La Campagnette is just 3 miles from our Virginia inn. This lovely property built in 1890, and has been extensively renovated. The property feature Two Suites and one Grand Master Bedroom, situated on 18 beautiful landscaped acres complete with swimming pool and hot tub. Perfect for cocktail parties, weddings and small conferences. The Restaurant at L’Auberge Provencale is a four star restaurant open to the public as well as our over-nite guests. Dine in one of the three intimate dining rooms, decorated with antiques, fine art, Provencale fabrics, and artifacts from Spain and France. Using herbs and vegetables from our own garden, and the freshest ingredients, many from local farmers, Chef Alain creates elegant cuisine with definite seasonings as in Provence, with a light hand on the sauces; each a picture to please the eye as well as the palate. Complement your dining experience with excellent wines from our extensive wine cellar featuring French and American chateau wines. Our Virginia Wine Country Inn is a perfect setting for dress rehearsal dinners, weddings, and business dinners. We do have special package rates for small business conferences mid-week. Please give us a call and we will help you arrange the details for your special occasion. Villa La Campagnette is a wonderfully romantic setting for weddings, rehearsals and outdoor events. L’Auberge Provencale’s chefs will cater your event to create a celebration to remember. Stay 2 nights in any room and the 3rd night is free at our lovely French-inspired property. Enjoy romantic lodging, fine dining, wine tasting, private winery tours, our NEW tavern, our outdoor pool and incredible breakfast.